Early morning, going to work driving in the Asti area, the first silent mists were all around me. I decide to stop briefly to take some pictures. In my mind the evanescence of the far background, the few trees in the middle and the soft sunlight render well the idea of the upcoming autumn season. 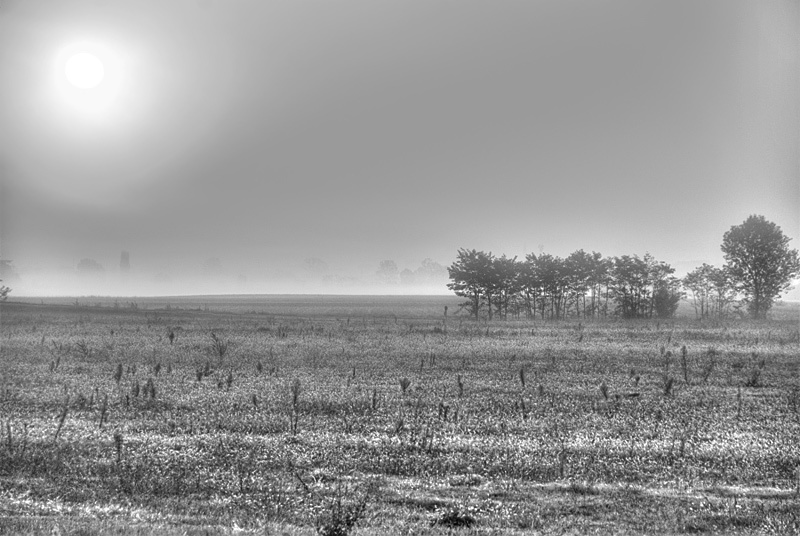 This entry was posted in Black and white, Landscape and tagged Asti, autumn, Black and white, HDR, light, morning, picture, sea, silence, soft sunlight, sun, sunrise, tree, trees. Bookmark the permalink. hai reso magnificamente l’atmosfera, stupenda. Really beautiful. Thank you so much for your comment ! very very cool …. love the silver glint on the mist ! Thew morning mist and landscape are simply beautiful. Love the mood you created in this picture, great job! Great landscape. Amazing in the fog. O, wonderful image! So wonderful! This picture could really be anywhere. The fog combined with the low hanging sun looks awesome and helps flatten the already enervated terrain. Very atmospheric. I really like it, beautiful! Beautiful landscape, I maid prefer horizon on 1/3 from bottom in favor of sky?